The basic meaning of Inheritance is using a pre-defined code. This is the main advantage in Object oriented Programming (OOPS), where one can use a code that has been previously written and defined but with the condition that the code is used as-is or in other words, we are not changing the code. All the pre-defined code is used resides into classes. To use those codes, we use a feature called inheritance, whereby, we "inherit" those classes. 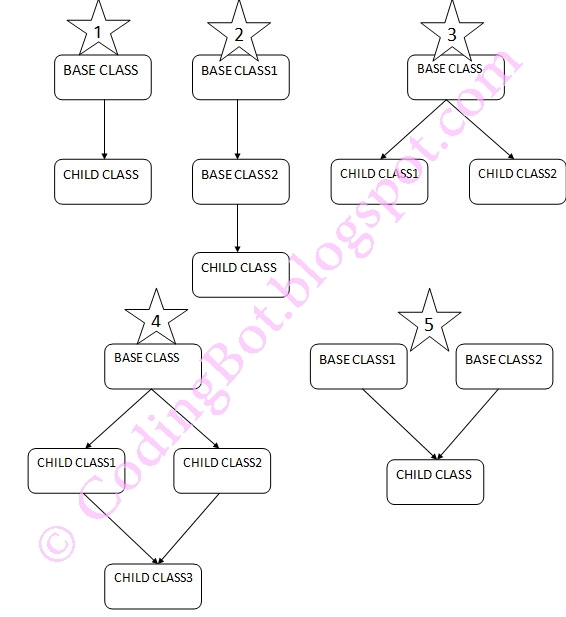 The class from which other class inherits is called as Parent or Base Class and the class that inherits is called as Child or Derived Class. Here, by 'X' we mean that, that object is not inheritable. Remember, Private objects and functions are never inherited. I'll be discussing about these types of inheritances individually in my next post. The program is very simple. First input is taken from the user that tells how many terms of the Fibonacci series will be generated and then as described above, a function is called in a loop to add the previous two numbers and generate the next number in the series.